Daniele San Román is currently a third-year law student originally from Long Island, New York. At W&L she serves as a Law Ambassador and a Lead Articles Editor for the German Law Journal. Daniele is interested in patent law; after graduation she will work at Finnegan, Henderson, Farabow, Garrett, and Dunner as an associate in Washington, DC in their biological and pharmaceutical practice group. The DC Program at W&L has many benefits that I have heard and talked about, time and time again—networking opportunities, hands on experience, getting a different perspective, etc. Of all the benefits I enjoyed this semester, the one that stood out most was one that was not often highlighted: The DC Program affords W&L students an incredible opportunity to tailor their legal education the way they want to. W&L is a small school with incredible faculty and administration who work hard to make each student’s experience personalized, and the DC Program exemplifies this goal. I have a background in biochemistry and am pursuing a career in patent law. While the intellectual property courses offered at W&L are excellent, the population of students interested in IP is small, which in turn means there are only so many courses offered. My experience in the DC Program allowed me to vastly improve my knowledge of patent law in a practical, hands-on way. Throughout the semester I worked as a Judicial Intern to the Honorable Jimmy V. Reyna on the U.S. Court of Appeals for the Federal Circuit. This appellate court has subject matter jurisdiction over issues including patent law, veterans’ benefits, and government contracts. Approximately 60% of the appeals heard at the Federal Circuit are patent law cases. For law students and young lawyers interested in patent law, the court is a great place to learn about the subject they are passionate about. Over the course of the semester, nearly half of my assignments included issues of patent law. I expanded my knowledge in areas I had already worked in, and I gained substantive knowledge in new areas of the law as well. I was fortunate to work in a collegial environment where Judge Reyna and his law clerks were happy to devote significant time and energy to teaching and training the interns. On a daily basis I was engaged in detailed substantive discussions with the law clerks and researched nuanced areas of the law. Throughout the semester I appreciated how effective hands-on learning is for me. Performing these tasks made me excited to use the skills and knowledge I learned. Even if I had taken a full course load of patent classes, I would not have gained as much practical knowledge of patent law as I did in Judge Reyna’s chambers. My internship this semester helped me to grow professionally and to appreciate how impactful learning through experience can be. 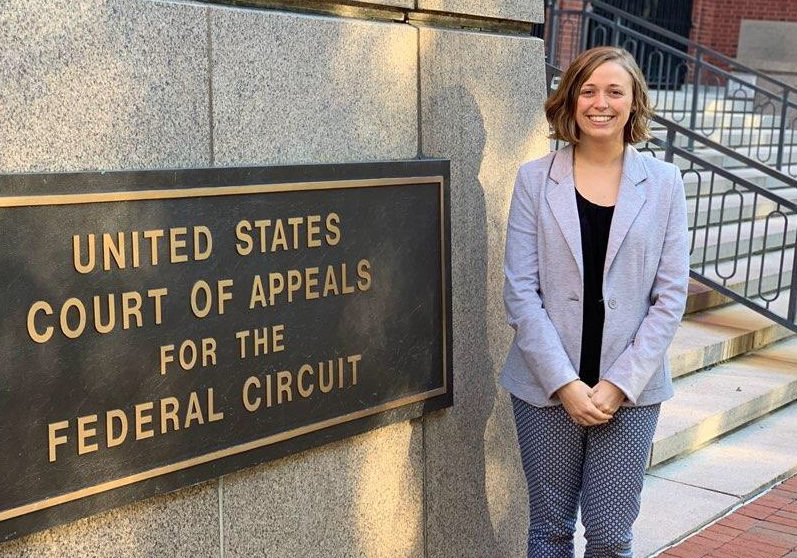 The opportunity to work at the Federal Circuit as a full-time intern was invaluable. I am grateful for the patent law knowledge I gained, as well as the vast improvement to my writing. I chose to attend W&L for the opportunity to participate in the DC Program, and the program exceeded my expectations in every way. This program emphasized the commitment at W&L to provide students with a valuable and personalized education.